Wii Fit Plus is hitting store shelves across the U.S. this weekend, so you know what that means: Nintendo's PR people are hitting the streets to give that sucker one last push. Their hard work seems to be paying off, at least in terms of publicity. Quite a few news outlets have published articles about the Wii Fit semi-sequel in the last few days, including Forbes.com. 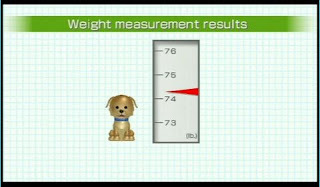 The most interesting thing about these articles (to me, at least) is that many of them focus on the title's "pet support"--i.e., it allows players to create avatars of their dogs and cats and then use the Balance Board to weigh (and continue monitoring the weight of) their furry friends. We've got a huge fatass of a cat, too...maybe we should get Wii Fit Plus.